Home of the Siamese Collection, within the private world of Bing Soravij BhiromBhakdi, where things go historical, back to the basics of being Siamese. This site began from my research into my own family tree back in 2000. 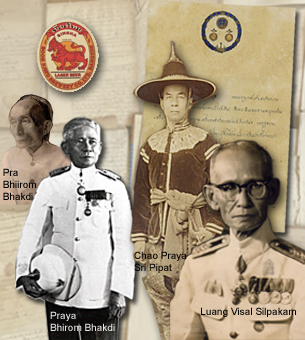 Having a personal interest in the Royal Family of Thailand, as well as the history of Thailand overall, it keeps on expanding when I find some new information that I want to catalogue, mostly for my own reference. I have also started to collect old photos and documents, many from sources outside of Thailand, wishing to bring them back home. I have decided to include them here as well, mostly as a personal reference, and to share to those who might be interested. Please feel free to leave comments, as I do try to make the information as accurate as possible. All the information are facts that I have found in books, on-line as well as from talking to the older generations. I do hope you enjoy going through this site, and I hope to keep on expanding and adding new information when time permits. It has turned into a sort of virtual scarpbook a bit, and needs redesigning from time to time. Enjoy! - 4-6 May 2019 - The Coronation Ceremony of HM King Maha Vajiralongkorn Bodindradebayavarankun, who will officially become King RAMA X of the Chakri Dynasty.